I spend a lot of time on this blog preaching about my favorite exercises. They're usually the exercises I love because they're safe, but also because they tend to give you the most bang for your buck. Today, I'm flipping the script. Instead of telling you which exercises you should do, I'm going to tell you which exercises you need to avoid at all costs. Why? Because it's all about keeping you on the path to getting stronger, and the five exercises below can actually be quite dangerous to your health. When you flex your lower spine, it's really as bad as it looks. Yes, you read that correctly. The sit up is an antiquated movement, reserved for only those that actually want to experience some type of lower back problem (I sure hope that's not you). As I wrote here, think of your lower spine as a credit card. Yes, you can bend it, but the more you bend it (especially under a load), the more it's prone to snap in half. Lower back expert Dr. Stuart McGill has researched this movement more than anyone else, and he's found that the compressive load on the lower back during the sit up actually exceeds the standards of the National Institute of Occupation Safety and Health. Yes, that's correct. Now, is it safer for your back to lift a piano than do a sit up? I wouldn't go that far. But, if you want to train your core, think about resisting forces (i.e. planks) rather than creating them. Behind the neck press - in his case, it also comes with a strained neck! For starters, many people aren't even in a good place to do any type of overhead lifting. Why? It's called having a desk job, and it's typically working against your shoulder and thoracic spine mobility. Further, most people tend to go into hyperextension when they lift overhead, which means their spine resembles more of a question mark than anything human. In that case, you need to work on developing a lot more core strength before you can even punch your ticket to the overhead pressing train. But, perhaps this one wouldn't be such a terrible exercise if most of the population could do it correctly....just kidding, it's still a terrible movement. Why? Pick up your hands and assume the position of this guy on the right (but without the bar). I'm not sure about you, but it hurts my shoulders even to think about, nevermind all the bones and ligaments clunking together inside your shoulder. This movement is a recipe for a disaster, and if you want to train your shoulders, there are plenty of other, safer exercises. Skull crushers are an exercise that, with moist hands, can live up to its name. Also called tricep extensions, this exercise makes the list for a few reasons. The first being that if you want to build bigger triceps, my first question will be: "What did you bench last time you were in the gym?" If you're a guy, and the answer is anything less than 300, you are wasting your time. Bigger lifts like the bench press (or the deadlift) have a way of morphing your body unlike anything else. When you're able to lift more weight on the bigger lifts, everything else simply gets stronger. Ask yourself this: have you ever seen a 300 pound presser with "small arms?" Further, just look at the picture on the right. Yes, he may have bigger triceps than you, but if he misses that rep he'll have a concussion to boot. I hate Bosu balls more than just about anything (check that, the list actually goes: bats, Tracy Anderson, snakes, Justin Bieber, and THEN Bosu balls). 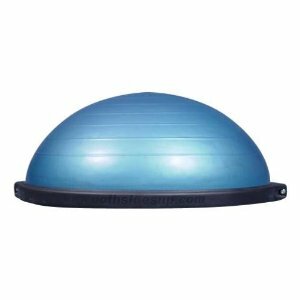 Somehow, these stupid pieces of equipment have become synonymous with the words "functional training," yet when is one ever on a blue, cushy, unstable surface outside of the gym? If you want to add instability to a particular movement, like a squat or a deadlift, just do it on one leg. As I've told my clients - there's nothing "functional" about a broken arm....it's actually quite the opposite! I always think back to Mike Boyle who has a great line called the "poop test." What is it? If it looks like poop, smells like poop....well, it's probably poop. The same could be said about this style of pull up. As I mentioned with pressing things overhead, most people don't have the adequate mobility to be doing anything overhead in a safe manner...nevermind swinging their entire bodyweight from a bar! That's not even mentioning how a quick YouTube search will yield a list of many people simply falling off the bars. When you perform a pull up with this type of extra movement, you're no longer working what you set out to accomplish. Yes, you'll be able to do more repetitions performing them this way, but that's not what it's about. Instead, it's time to start calling them what they are - bodyswings. Hope you enjoyed this piece, and that you, nor your friends, are performing these exercises. Stay tuned for next week, when I unveil My Top 5: Best Exercises!